Two of the things Newport is most famous for are mansions and sailing. 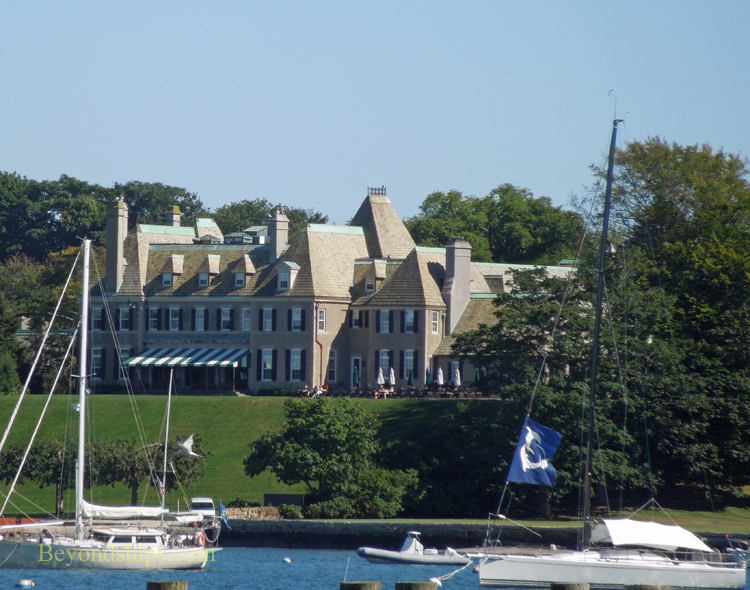 Above is Harbour Court, built for Mrs. Natalie Baynard Dresser Brown in 1903, it is now the Newport headquarters of the New York Yacht Club, which held the America's Cup from 1857 until 1983. For more than half a century, the races in which it defended the cup were off Newport. 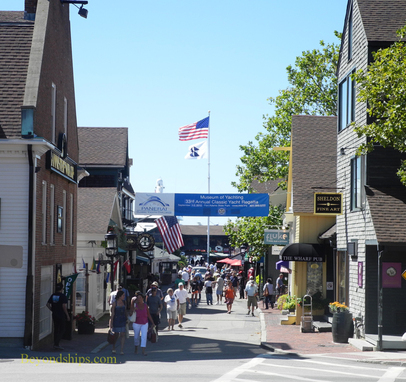 Newport is a unique cruise destination. It is a city where a rich past co-exists with a modern resort community. Today, Newport attracts people with diverse interests. For those who are interested in sports, there is the sailing and the International Tennis Hall of Fame. 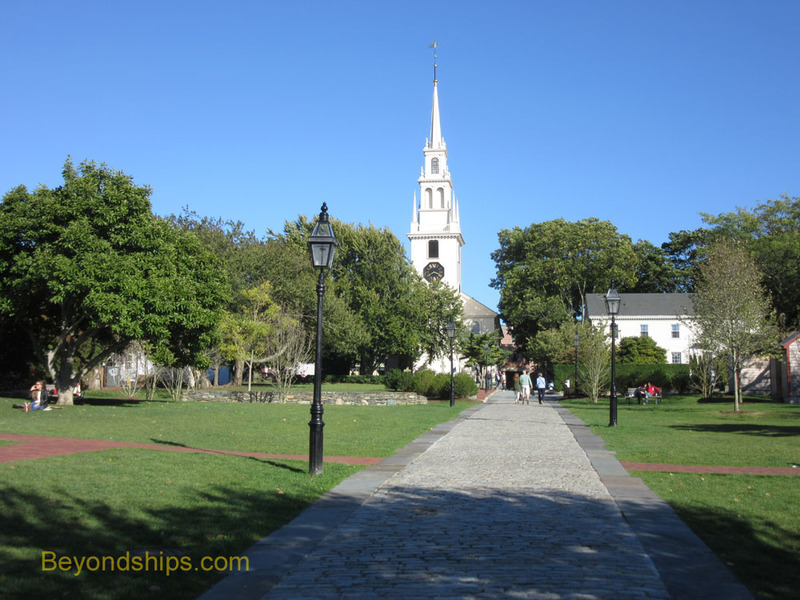 For those interested in history, there is the Historic District with its colonial and early American homes and buildings. The Gilded Age mansions will also appeal both to historians and those who are interested in art and architecture. Shoppers will appreciate the revitalized waterfront with its upscale shops and restaurants. 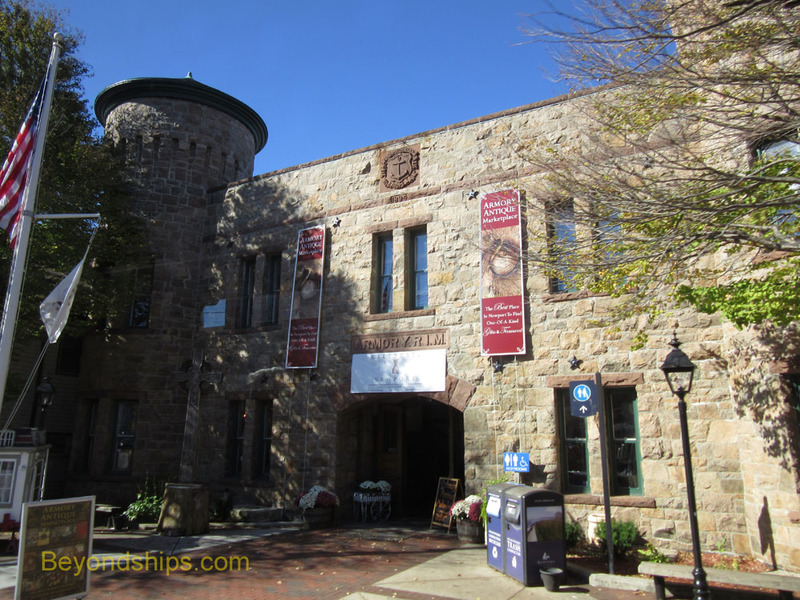 Newport is located on Aquidneck Island (also somewhat confusingly called Rhode Island) in Narraganset Bay in the State of Rhode Island. The city is built on gentle slopes around a sheltered harbor. While the city has been extensively developed, there are lots of trees and green space. It has a population of about 24,000 people. The number of people swells during the summer months when the tourists arrive. Still, the city does not feel overcrowded. It is not difficult to get around in Newport. The cruise ship tenders dock in the downtown area near the shops and the restaurants. The Historic District is within moderate walking district. The Gilded Age mansions are further away but the town has a developed public transportation system that will take you there. There are also tour providers offering excursions by land and sea. What were commercial wharves and warehouses in an earlier era have been converted into upscale shops and eateries. 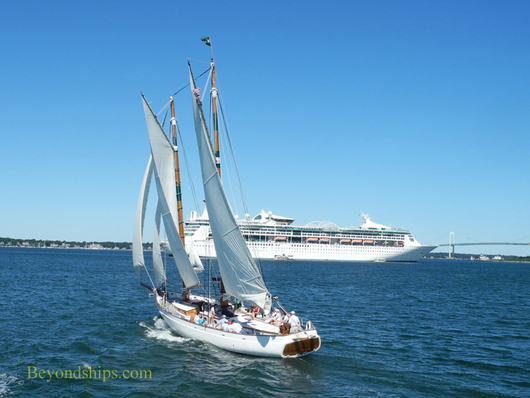 The atmosphere is enhanced by the proximity of Newport's pretty harbor and the hundreds of boats anchored there. Newport is very much a city linked to the sea. It grew to importance as a commercial port. It has a long association with the Navy as well. It is the traditional capital of American recreational boating and yachting. It offers spectacular views where the land meets the sea. What better way to visit than by ship? Above: Bannister's Wharf dates from colonial days and is part of the revitalized waterfront area with restaurants, shops, pubs and a marina. 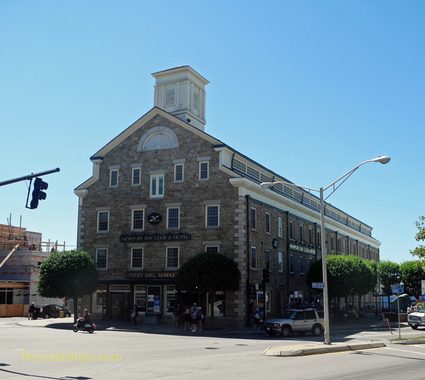 Above: The Perry Mill on the waterfront was built in 1835 and has been converted to shops and a hotel. Below: The Brick Market Place has some 25 shops and eateries. It is across America's Cup Avenue from where the tenders arrive. 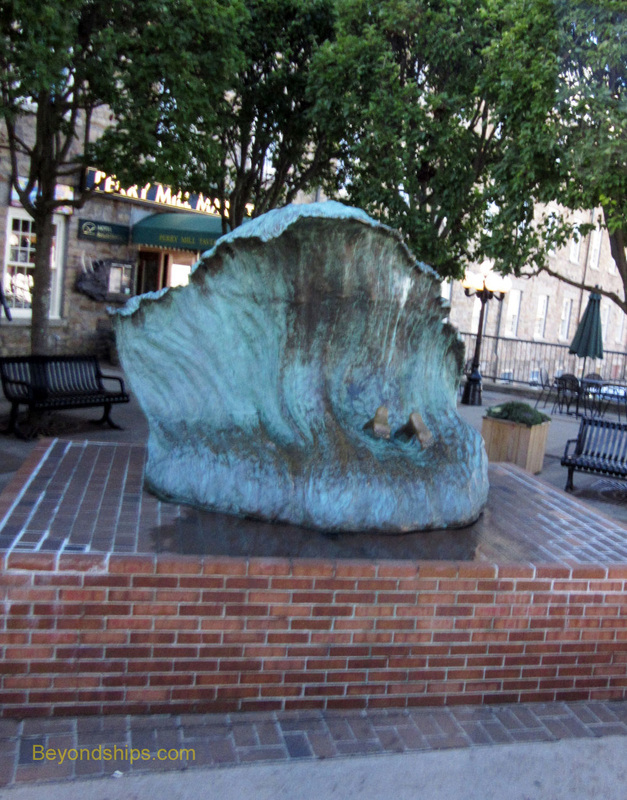 Left: "The Wave" by Kay Worden is a sidewalk sculpture in Newport. It features a pair of feet sticking out of the curling water. Local pranksters place socks and shoes on the feet from time to time. 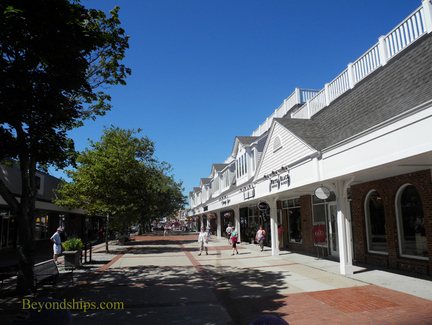 Below: The village green in the center of Newport was created by Doris Duke in the 20th century. She purchased the land, tore down a number of unsightly buildings and restored several historic houses. The result is a charming green space.